I've been thinking a lot about Richard Baxter, Christian History & Biography, and chocolate. Richard Baxter for obvious reasons. The first time I ever heard his name was when my roommate in seminary had to read his book The Reformed Pastor for her pastoral counseling class—and kept raving about it. A 17th-century book as assigned reading for 20th-century pastors? After learning more about him during the editing of this issue, I am beginning to understand. 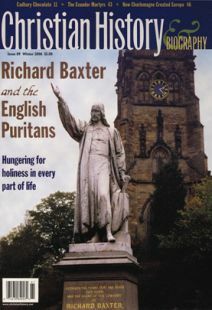 "With so many Puritans to choose from, why turn the spotlight on Richard Baxter?” we asked J. I. Packer, who speaks of the great 17th-century preacher as familiarly as if they had grown up down the street from each other. Many reasons: Baxter lived through so much of the Puritan era—from 1616 to 1691. He wrote what by many standards is the best record of it, from a personal standpoint, in his autobiography. He was one of the top Puritan leaders of his day, the most successful Puritan pastor, and the most prolific Puritan writer. From him it is not a far leap into the wide spectrum of opinions, personalities, and experiences that make up English Puritanism as a whole, including one of its abiding characteristics: the belief that all real theology is practical theology. This issue of CH&B is not only about a certain group of people who longed, but in many ways failed, to change their world. It is about a certain kind of theology lived out in ministry, in the discipline of daily life, in the family, in secular vocations, and in the larger society. The Puritans were certainly not without their faults. But as Dr. Packer told us, in all of their diversity and adversity, their triumphs and setbacks, two very deep concerns emerge: how to be holy and how to be human. And the Puritans’ convictions about Christian vocation and the God-givenness of all of life have made me think about this magazine staff and the little things that make a workplace a space of sacred encounters and spiritual significance. As our art director of 14 years, Rai Whitlock, has been struggling with illness (and we've been struggling with his absence), we have been grateful to benefit from the excellent creative skills of freelance designer David LaPlaca. We have also had the pleasure of welcoming a new assistant editor to the CH&B team. Rebecca Golossanov brings a passion for church history, a healthy dose of cross-cultural sensitivity (she is a Virginian married to a Russian), and a keen eye for grammatical gaffes and factual goofs. Her background in visual communication and art history ideally suits her for the very important task of picture research—digging through 2000 years of art, artifacts, maps, and photos to find those choice examples that will help us take you on a visual journey through the heritage of the church. Fifty years after five missionaries were murdered in Ecuador, their story still inspires.